Insect repellents serve a valuable purpose by discouraging biting insects, which can cause itching, pain, parasites and disease. 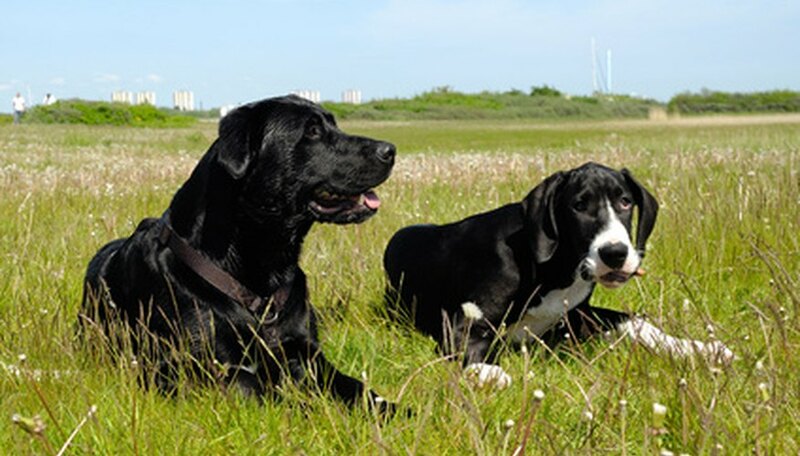 Dogs, due to their active outdoor lifestyle, care at risk of contracting often deadly insect-borne diseases or parasites, such as Rocky Mountain spotted fever, Lyme disease, West Nile disease, Ehrlichiosis, heartworms and Babesiosis. By applying insect repellents to the skin and fur, dogs can comfortably enjoy outdoor activities without fear of vector-borne diseases or painful bites. An insect repellent can be made up of natural or chemical ingredients. Most biting insects are attracted to the odor of the dog's skin. The insects are attracted to the carbon dioxide that animals exhale, according to the Centers for Disease Control and Prevention. Repellents help mask the odors and drive the insects away with a smell that insects find repulsive. Topical and oral insect repellents work for about 30 days on dogs. They work by causing the death of insects that come into contact with the dog, and they also kill any eggs laid on the dog's fur. The lotion and spray repellents work only on insects that are nearby. As dogs run through brush, roll in grass or lick themselves, the spray and lotion insect repellents becomes less effective and may need to be reapplied. Monthly topical applications are effective for 30 days unless the dog is bathed regularly or swims often, which can wash away the repellent. Oral repellents work for 30 days no matter what the dog does, but they must be prescribed by a veterinarian. Lotions and spray insect repellents offer short-term control. They are applied over the dogs fur from head to tail. Avoid getting the chemicals into the dogs eyes, mouth, nose or ears because initiation may occur. Many dogs are sensitive to the repellents and may suffer skin irritation, according to Vet Info. Topical repellents are applied monthly by dabbing a couple of drops of repellent between the dogs shoulder blades. Oral repellents come in a pill form and are swallowed by the dog. Natural lotions and sprays contain such detracting substances as eucalyptus oil, tea tree oil and oil of lemon eucalyptus, and they have no chemicals in their makeup. Dogs that spend a great deal of time in the garden area will benefit from having insect repellent plants planted around the landscape. Catnip grows easily and will tolerate a wide range of soils. It naturally repels mosquitoes due to the odor of the oil it produces. The oil from citronella grass has been widely used as an insect repellent in candles or lantern oil. The grass also naturally repels insects in the yard and offers an ornamental look to the flower garden. Marigolds also repel many biting insects and help protect garden plants from pests. Insect repellents help prevent dogs from contracting many deadly diseases. Rocky Mountain Spotted Fever, a tick-borne disease, causes a dog to run a high fever and suffer joint pain. If not promptly treated, it can result in death. Both heartworms and West Nile diseases are transferred to a dog by a mosquito bite. West Nile disease causes deadly encephalitis. Heartworms, which can be contracted by a mosquito bite, is a parasite that can seriously damage the heart of the dog and cause death. Symptoms of Babesiosis and Ehrlichiosis, both tick-borne diseases, may not manifest themselves for years after infestation, and can lead to death of not treated.